ASTANA -- Russia's renewed effort to bolster its military presence in Central Asia is aimed at least partly at extending its influence in former Soviet states and deepening their dependence on Moscow, warn independent observers. Russian troops are still deployed in Kazakhstan, Kyrgyzstan and Tajikistan more than 26 years after the end of the USSR, bringing along with them environmental and sovereignty concerns. During a conference in April of Shanghai Co-operation Organisation defence ministers in Beijing, Russian Defence Minister Sergei Shoigu announced Russia's intention of increasing the combat readiness of Russian military bases in Tajikistan and Kyrgyzstan, providing them with modern armament and military equipment. 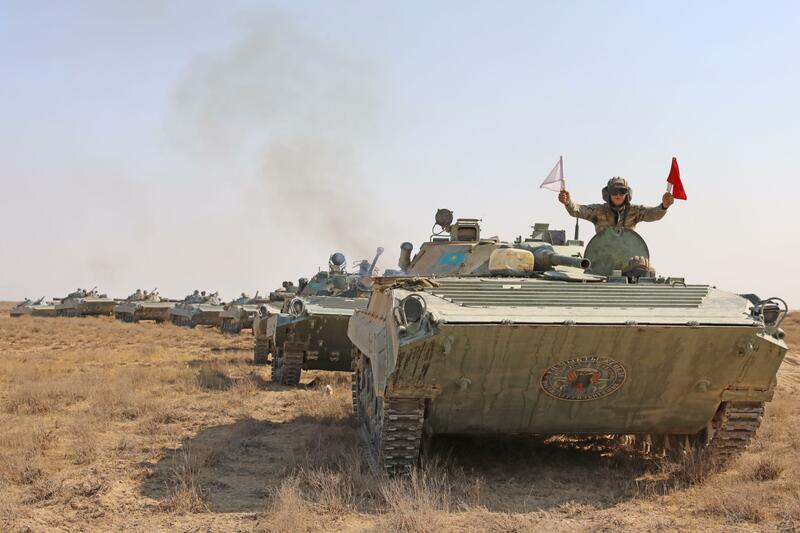 Russia also participated in joint counter-terrorism exercises in Tajikistan and Kyrgyzstan in March, Shoigu said, adding that more such exercises are planned for Kazakhstan, Kyrgyzstan and Tajikistan this autumn. Russia is taking those steps to prevent militants based in northern Afghanistan from infiltrating Collective Security Treaty Organisation member states in Central Asia, he claimed. At the same time, the Kremlin has been regularly reporting that militants are massing along the 1,344-km Afghan-Tajik border -- a number that keeps growing, in the Kremlin's telling. In late 2017, Russia put that number at about 10,000, including 3,500 members of the "Islamic State". However, in 2015 Moscow said the total number was 4,500. Russia's planned buildup in Central Asia says more about Moscow's determination to reassert control of its lost Soviet territories than it does about "protecting friends from enemies", contend independent observers. Moscow's cited reasons to boost readiness do make some sense, said Nodar Kharshiladze, a Tbilisi-based political scientist and founder of the Georgian Strategic Analysis Centre. Such efforts could be directed against Islamist terrorists and illegal drug trafficking emanating from Afghanistan, he told Caravanserai. The Kremlin does have a legitimate interest in neutralising such threats as far as possible from Russian borders. But Moscow has ulterior motives too, he warned, such as its goal of maintaining influence in a region where China is becoming a resurgent rival. Besides investing in Central Asian countries, "China traditionally conducts military exercises with its neighbours," Kharshiladze said. At the same time, Central Asia increasingly has become a focus of attention for even the geographically distant West, he said. Kazakhstan, a long-time Russian ally, has recently boosted its co-operation with the United States, even in military matters. Competing with China and the United States makes Russia nervous, according to Kharshiladze. Moscow's discontent over losing influence in Central Asia is obvious, say other observers. Russian "puppet media" are expressing "systemic dissatisfaction" with Astana's recent departure from Moscow's expectations, Almaty-based political scientist Marat Shibutov told Rezonans.kz in April, referring to Kazakhstan's overtures to the European Union and United States. For example, Kazakhstani lawmakers March 6 approved a draft law opening up two of its Caspian Sea ports as transit points for the delivery of non-military goods from the United States to Afghanistan, bypassing Russia. Russia is not afraid to use "disinformation and fake news" against Kazakhstan, Shibutov said. Although Kazakhstan and Russia have co-operated in the past, blind trust in such an unreliable ally could be dangerous, say several Kazakhstani observers. The two countries, for example, share an air defence system based on Russian technology. Such Russian-designed systems create geo-political risks for Kazakhstan, said Almaty political scientist Ruslan Zhangazy. The country's defence "must not be entrusted to another state, even an ally", he told Caravanserai. Russia already showed its unreliability when it flagrantly violated the Budapest Memorandum on Security Assurances, he said. Under the 1994 agreement, Russia committed to non-aggression against Ukraine, Belarus and Kazakhstan in return for them giving up their Soviet-era nuclear weapons. In 2014, disregarding the pact, Russia annexed Crimea from Ukraine and sent Russian troops and mercenary "volunteers" to support separatists in eastern Ukraine. Fighting continues today. With that behaviour, Russia showed that it considers "an international treaty merely a piece of paper", said Zhangazy. "We are ... [foolishly treating] this memorandum as a guarantor against threats." The dependence of fledgling Central Asian militaries on Russia is another factor increasing those countries' vulnerability, said Kharshiladze. The training of countless Central Asian troops and security personnel in Russia over the decades since Soviet times makes infiltration of Central Asia's defence, security and law enforcement systems a simple matter for Russian agents, he said. Furthermore, joint exercises give the Kremlin "valuable information about the combat and operational capabilities of local militaries", he said. "Such knowledge is an important advantage in a conflict." If Russia feels endangered by developments in Central Asia, it has a broad variety of assets, including military ones, to maintain influence in the region, according to Kharshiladze. The concern is not primarily about direct aggression, he said. "More likely, Russian military bases will be used for non-traditional and hybrid tactics -- clandestine operations, sabotage and incitement of ethnic tension," he told Caravanserai. "These actions will be supported by cyber-attacks and information warfare conducted from Russian territory," he said. "A similar role was played by Russian bases in Georgia [in its breakaway regions of Abkhazia and South Ossetia] in 1991 to 1993 and in 2008 and in Ukraine [Crimea] in 2014." Having witnessed the Kremlin's deeds in Georgia, Ukraine, Moldova and the Baltics, Kazakhstani authorities entertain no illusions about their "strategic ally". Last October, President Nursultan Nazarbayev approved Kazakhstan's new military doctrine, which took into account lessons from the war between Russia and Ukraine. Kazakhstan is spending more on defence too, according to the Finprom analytical website. Defence spending in the first two months of 2018 exceeded the same period in 2017 by 7.7%. At a military parade held on May 7 in southern Kazakhstan, Nazarbayev announced that high-mobility special forces had been created to react efficiently to new security threats and challenges. "Present-day geopolitical reality mandates the need to be ready for anything," he said. I can agree from one point, but this article cannot make us think negative about Russia. Crimea and people who live there were included into Russia by their own free will. This article is the pure truth. The site is sheer propaganda. Hey, Yanks, describe your training areas starting from 1945: Japan, Vietnam, Yugoslavia, Iraq? Iran and Korea are next in line. You rotten lice. Russian trolls have infested this web site. The article is pure anti-Russian propaganda. Be afraid of corruption where you are, not in Russia. This is all poppycock - Russia won't let the CIS countries have some space to breathe comfortably. [Russia] openly threatens our governments, that's obvious. Why do you need these authorities if they kick you around so hard that millions of your people are fleeing to Russia to provide for their families? Get them [the government] the f..ck out and go back to the Empire and then you wouldn't give a damn about the Taliban, Chinese or other Yanks! Is China any better than Russia or the Brits or the Yanks? The USA created the situation in Ukraine, and in many other countries where [the US] has meddled in their internal affairs. Russia had to respond to that. Utter nonsense. Does the author question the gravity of the terrorism threat, especially coming from neighboring Afghanistan? If he does, then journalism should not be his profession. Chinese behaviour in the region belies the old assumption that Beijing cares only about economic investments -- and is increasing tension with Russia, analysts say. 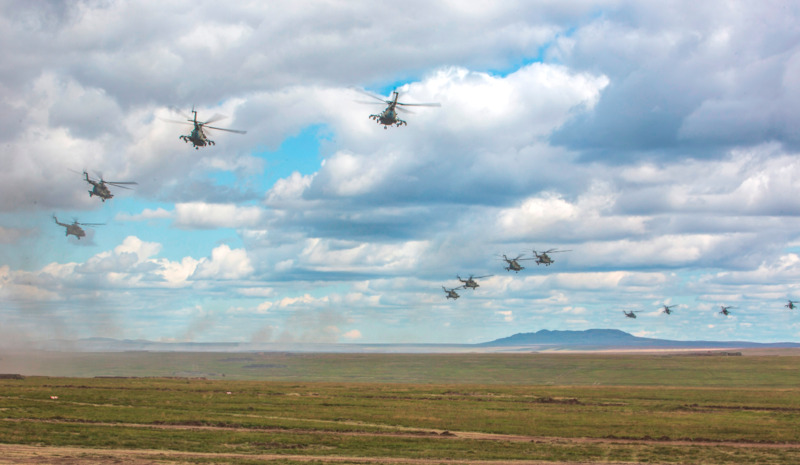 The reported involvement of 300,000 troops in the drills is a stark reminder for Central Asians of Russia's recent invasions of neighbouring countries, including Ukraine and Georgia.